Pat Gambino borrowed heavily to build a $2.7 million service center that opened in 2000. After business plunged, he was forced to take a buyout. “It makes me cry,” he says, walking through his empty store. BUFFALO, N.Y. -- Leading a visitor through his deserted Ford store on a crisp fall day, Pat Gambino is proud, sad and filled with regret. "It makes me cry," he says, pulling a plaque off the wall and looking at a reproduction of an article published in Ford's Dealer World magazine. The children's playroom is intact. An empty saltwater aquarium sits in the mezzanine waiting area, which gave customers a picture-window view of their vehicles being fixed. "This truly is a sin for this to be sitting empty like this," Gambino says. Gambino's somber tour is the flip side of the success that surviving Buffalo Ford dealers are enjoying. For them to thrive, others had to go out of business. Gambino, 57, thought he would be on the other side of that equation. Instead, he now is working with his bank to sell the vacant property on a northern stretch of highly trafficked Transit Road, the auto row of greater Buffalo. Gambino had ambitious goals and borrowed heavily to achieve them. He wanted Gambino Ford in Lockport, N.Y., to be the Ford dealership of choice in the northern Buffalo area. He had 30 acres and plans for a palatial 38,000-square-foot store. The plan would more than satisfy Ford's Blue Oval requirements. Gambino got halfway to his dream -- then watched it fall apart. "I put up a $2.7 million facility," Gambino says of his lavish service center with heated floors and 30 bays that he built in 2000. "I drank the Kool-Aid, and I had a preferred location. But in the end, I lost." Without the heavy debt load for the service center, Gambino figures he still would be making a go of it. Gambino, an expressive Italian-American with a booming voice, was on board with Ford's market consolidation from the beginning. He never expected to raise his own hand for a buyout. He had planned to build a new showroom to match the service center. But during the decade, business fell in half. Ford's market share spiraled, Buffalo's economy faltered, and last year's industry sales collapse delivered the final blow. Losing money and running out of cash, Gambino Ford closed in December 2008. Gambino had hurried to accept a buyout offer from Ford Motor Co. that he feared might expire at year end. One nearby dealer also pitched in buyout money. 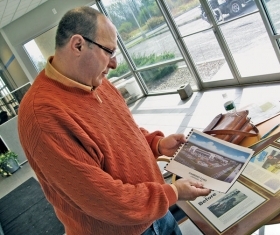 On the same piece of property almost four decades earlier, at what then was called Lockport Motors, Gambino started his automotive career as a 19-year-old washing cars. His dad was general manager. In 1975, Gambino and his dad bought out the former dealer, using a $10,000 down payment that Pat and his young wife had scraped together. In 1983, Gambino bought out his dad, who went on to buy and sell Ford and Toyota stores in Niagara Falls. As business worsened late this decade, an attempt to dual with Mazda fell through. The dealership got behind on taxes, and the bank started foreclosure proceedings. Sales were decimated by market swings in the summer of 2008 and the credit crisis that followed. Gambino put personal money into the business. But he couldn't rescue it, and Ford's offer deadline loomed. He hasn't filed bankruptcy and hopes that day never comes. Just before Thanksgiving, his wife of 38 years, Terri, opened a UPS franchise store in Lewiston, N.Y., where the couple live along the Niagara River overlooking Canada. Gambino and his son, John, who had been the dealership's general manager, are developing an auto financing company to lend to customers who are having difficulty finding credit. Though he dislikes the way some Ford representatives treated him sometimes, Gambino doesn't blame Ford. He supports dealership consolidation. It's been good for the surviving stores. He just wishes he had been one of them. In hindsight, he says he probably should have taken over his dad's Toyota store rather than sticking with Ford. But he couldn't bring himself to make the switch. "I love Ford," Gambino says, his voice breaking. "I'd get into fights with kids as a kid over which [brand] was better."